Tuesday January 26 1909 It was a fine day. I did a lot of washing and used the water to scrub up things thoroughly. I rested awhile in afternoon and then ironed all the things before supper. made tatting in evening. 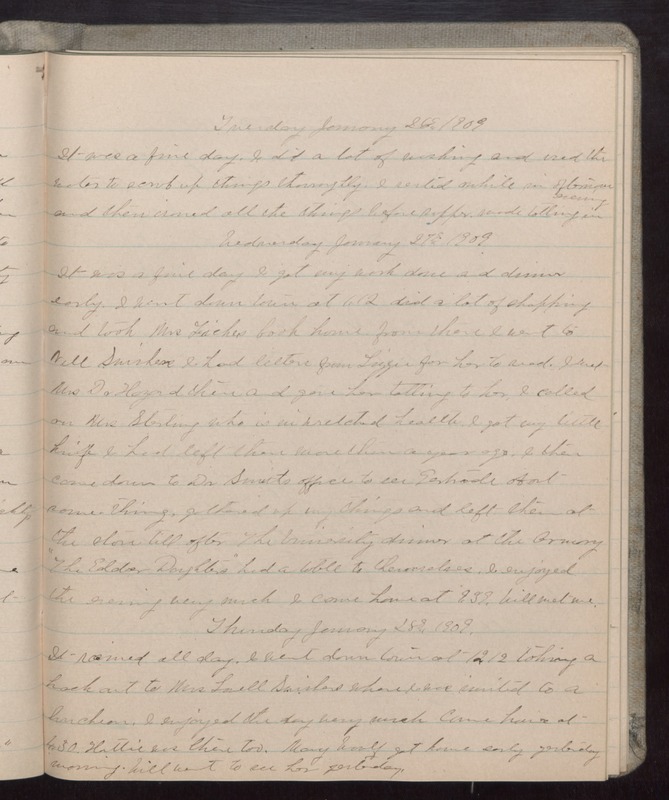 Wednesday January 27 1909 It was a fine day I got my work done and dinner early. I went down town at 1.12 did a lot of shopping and took Mrs [Fiches?] book home. from there I went to Nell Swishers I had letters from Lizzie for her to read. I met Mrs Dr Hazard there and gave her tatting to her. I called on Mrs Sterling who is in wretched health. I got my little knife I had left there more than a year ago. I then came down to Dr Smiths office to see Gertrude about some things, gathered up my things and left them at the store till after The University dinner at the Armory "The Elder Daughters" had a table to themselves. I enjoyed the evening very much I come home at 9.39. Will met me. Thursday January 28 1909 It rained all day. I went down town at 12.12 taking a hack out to Mrs Lowell Swishers where I was invited to a luncheon. I enjoyed the day very much Came home at 4.30. Hattie was there too. Mary Woolf got home early yesterday morning. Will went to see her yesterday.